As a developmental milestone, one would call it turn-taking perhaps, or understanding the other person's point of view or playing with another child........to me these are just different degrees of complexity of the same skill......however, if one looks at it in a different light, this really is the beginning of learning to be an integral part of this planet and the soul's path of self-inquiry. That is the way I like to look at this milestone in my son's journey. This delicate interplay of ourselves and our environment, community, or whatever else one may call it, happens every day, every moment, in every interaction, so subtly that unless one is conscious and aware of this, one tends to overlook it. Like Thich Nhat Hanh says in the quote above, we cannot be islands and just by ourselves......we have to Inter-be with every other thing. One cannot exist without the other. And when this realisation comes from the child, it is well worth all the struggle that he goes through. That was what happened today. It was one of the most amazing two hours that I have spent in my life today! - To be the witness and be the bridge for the struggle of two little human beings just embarking perhaps on their journey of self-discovery and inter-being.....to understand themselves and another human being. Raghav has been playing with this other little boy of his age from our building for a few weeks now. They have been mostly cycling around the block, or playing in the playground, playing cricket, football and so on. And the time for which they play together has usually not been more than 15-20 minutes or so....after a while, the other little boy, who would not get a turn to do something or not get listened to by Raghav, would get upset and usually say: "If you don't do this......I will not play with you." While I tried to gently suggest to him other ways of expressing how he was feeling when Raghav did not give him a turn or listen to him, he found it difficult to get away from his old patterns of thinking and saying. So I helped him by voicing out what he was feeling, and he would either nod and say yes or no. Many times, Raghav did not even heed me and just went away to do his own thing, even while I put across how his friend was perhaps feeling at that moment. Sometime later however, after perhaps he had mulled on this a lot after many interactions, Raghav once came up and asked me why his friend kept saying this same thing every time they played. I then explained what his friend perhaps wanted him to do, which he was not doing, and also that perhaps that was how his parents or family reacted when he did not listen to them, which he was now repeating with Raghav. My son listened intently and said that it would be better if his friend told him exactly what he felt. We then never spoke about this again. Today, we went down as usual to play and met this boy again. Both of them decided to cycle and have a race around the apartment blocks. I have been trying to dissuade them from having races, as there are areas where cars come in and go out. So they decided to avoid those parts or slow down completely there. This was the beginning of the struggle for my son to understand a part of himself and another person. They spent a long time discussing the rules, agreeing on some, disagreeing on others, arguing about the track they would take, the finish line and the start line.......it was endless! My only role through it all was to reflect each one's thoughts and feelings and clarify what each one was trying to say to the other.....and boy, was it tiring! It was exhausting! So, when they had agreed on things, they would set off on the race, while I tried to keep pace, and then wait for them at the finish line. Then, they would argue about who came first or won.....one would get upset while the other one enjoyed winning......and this went on and on! All my suggestions and preaching were in vain! The difference however, in what happened today was this - my son did not just walk away as he had done in the past, when there was an argument or lack of understanding between them. Instead, he seemed to want to play with this other boy and wanted to make an effort to understand him and get himself understood! This was a huge huge thing for me, as it had been a moment I had been waiting for a long time. They had a disagreement over which track to follow - while Raghav wanted to follow one particular route, this other boy was too much in a hurry to wait and see which way he had to go and often took another route, that upset Raghav! Then, they could not agree on the number of laps in the race. Neither of them was willing to give in and accept the other person's take on it, nor did they want to take turns to decide on the number of laps; nor were they willing to give up racing and playing with each other! It was a deadlock! So, when his friend used the same phrase again to control him and play on his emotions, Raghav showed dissent and told him that he did not like him saying that.....and.....he did not walk away or ignore him. He actually got upset when his friend cycled off in a huff and made me go after him, call out to him and talk to him. I did that every single time, as I knew he wanted me to stand up for him and be his voice. His friend however, knew perhaps that this was his chance to get Raghav to listen and kind of taunted him by going away and then coming back to find out how Raghav reacted and get him to race with him again on his terms. While Raghav wanted to talk it all out and make him understand, this little boy did not have the patience to do that and said so too! That was a huge step I think for him too! It was just so amazing to watch the unfolding of these two souls......the constant tug of war......the attempting to give and take...it was beautiful! Every time, Raghav made an effort to give in because he really wanted to - I could sense and feel that.....but it was with a lot of pain and lot of tears. I had to hold him, allow him to vent his feelings, wait with him, be with his feelings without intervening in anyway, and do what he wanted me to do for him. It was one of the most challenging roles I have ever played so far, but that was the only way. Finally, after almost two hours of going back and forth (yes! that was how long the struggle was! ), with a lot of resistance, hesitation and pain, he agreed to the number of laps that the other boy wanted to have in the race, but on the condition that he would decide the route. Both of them had finally won! And I was witness to this beautiful interplay of emotions of the souls of two kids who desperately wanted to be friends with each other. It had been a huge struggle, especially for my son, but well worth it! Then it stopped, as if it couldn't go further. To me, my son's struggle to understand himself a little more and another person's point of view was much like the butterfly's struggle. There was just no way that I could have made it a "better" or "easier"experience for him, as it was something that he had to go through on his own. If I had "helped" him, I would perhaps have been like the man who crippled the butterfly for life. 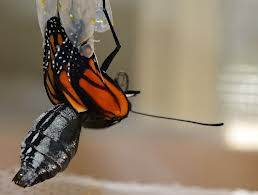 The struggle was what helped him transform himself and fly into a freedom that he was just beginning to know and understand......the freedom and the inter-connectedness of all of life.